With transactional data, you will often find your date-based summaries having one row per day. Although daily data might be useful to a plant manager, many people in the company want to see totals by month or quarter and year. The great news is that Excel handles the summarization of dates in a pivot table with ease. For anyone who has ever had to use the arcane formula =A2+1-Day(A2) to change daily dates into monthly dates, you will appreciate the ease with which you can group transactional data into months or quarters. Creating a group with VBA is a bit quirky. The .Group method can be applied to only a single cell in the pivot table, and that cell must contain a date or the Date field label. This is the first example in this tutorial where you must allow VBA to calculate an intermediate pivot table result. You must define a pivot table with In Balance Date in the row field. Turn off ManualCalculation to allow the Date field to be drawn. You can then use the LabelRange property to locate the date label and group from there. Figure 16 shows the result of Listing 4. PT.AddFields RowFields:="In Balance Date", ColumnFields:="Region"
16. 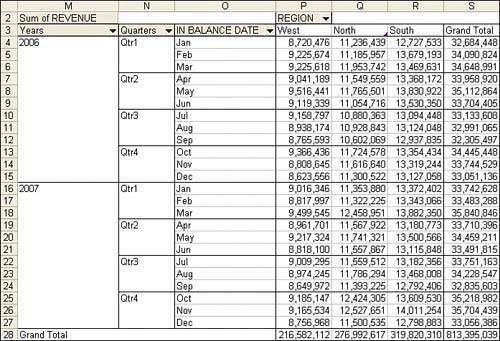 The In Balance Date field is now composed of three fields in the pivot table, representing year, quarter, and month.